Delivering a shipment of expropriated goods. 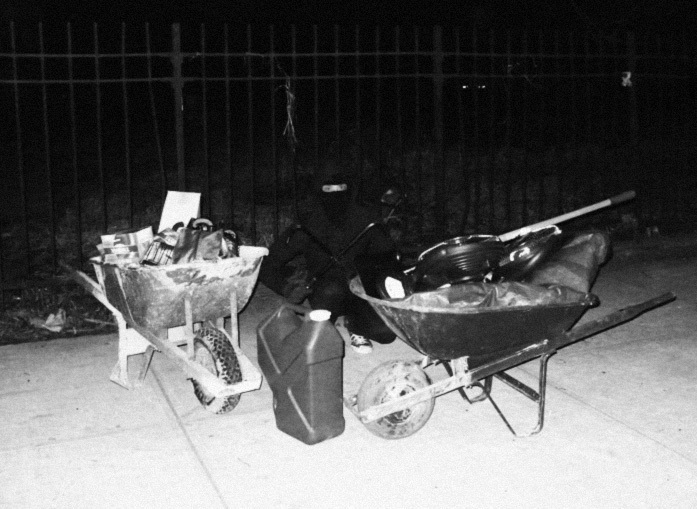 NEW YORK, NY—Over the past two weeks, a group of concerned New Yorkers has been expropriating thousands of dollars worth of tools and materials from luxury residential developments across Manhattan and delivering them to neighborhoods devastated by Superstorm Sandy. The confiscated materials, some of them never even used, include: shovels, wheelbarrows, hand trucks, pry bars, tarps, buckets, hard bristle brooms, industrial rope, contractor trash bags, particulate masks, work lights, work gloves, flashlights, heat lamps, and gasoline. Liberated from their role in building multimillion-dollar pieds-à-terre for wealthy CEOs and Hollywood celebrities, these tools are now in the collective hands of some of the hardest-hit communities in the city where they are now being allocated and shared among the people who need them most. These expropriations will continue as long as the demand for them exists. The targeted developments are being financed with over a billion dollars in bank loans plus untold millions in tax breaks from the city. All are slated to become high-end residential towers with apartments starting at upwards of $2 million, all no doubt with unparalleled views of the city—perhaps even all the way to its outer edges, where tens of thousands remain without power, heat, and hot water weeks after the storm. People continue to wait hours in line for blankets and batteries while the tools to improve their lives, the tools to help them literally dig themselves out from under the rubble, sit idle behind chained fences, safely tucked in beneath all-weather tarps or locked inside heated office trailers. Channeling its inner Scrooge, the New York City Housing Authority last week offered a “Christmas present” to its residents: a promise of a rent credit, effective sometime in the future, and only after they pay this month’s rent in full. The MTA is also getting in the holiday spirit, refusing to refund Metrocards for the days lost while the subway was shut down just as they push forward with another planned fare hike. How can people make rent when they can’t even get to their jobs? Perhaps this question was at the back of the mind of Anthony Narh, a parking attendant who literally worked himself to death during the storm inside an underground garage in TriBeCa while the owners of the multimillion-dollar lofts above fled to their second or third homes for safety. Here is New York: a city in which people write rent checks by candlelight, huddle around gas ovens for warmth, and are housed in shelters that are literally prisons—this is a city in which the darkness and misery are indeed all too literal. Luxury up front, desolation behind: this New York is but a cruel Dickensian reboot of a city. A cold winter is nearly upon us. In the coming days, Bloomberg will doubtless be seen doling out turkeys and vague promises at any variety of overflowing city shelters while the shutters snap away. As the rich and powerful ladle out their meager scraps and twist their faces into caring regard, those of us who envision a better world will be out in the streets, maneuvering in the dark, trying. Forest City Ratner, Tishman Speyer, Douglas Elliman, Brown Harris Stevens, Bovis Lend Lease, Bank of America, Citibank, Goldman Sachs, Morgan Stanley, Credit Suisse, Citadel Investment Group, Deutsche Bank, Time Warner Center, New York University, Sony, Bertelsmann, Conde Nast, I.B.M., Mayor Michael R. Bloomberg, Mayor Rudolph W. Giuliani, Boss Tweed, Bronx borough president & mayoral candidate Adolfo Carrión Jr., Councilman Peter F. Vallone, Councilman Larry B. Seabrook, Councilwoman Sandy Annabi, the Northeast Bronx Democratic Club, Yonkers Republican chairman Zehy Jereis, the FBI, the Department of Labor Inspector General’s Office of Labor Racketeering and Fraud Investigations, the New York Yankees, John D. Rockefeller Jr., Saul P. Steinberg, Ronald S. Lauder, John Gotti, Cosa Nostra, the Genovese crime family, the Colombo crime family, the Lucchese crime family, Mitchell-Lama, the New York City General Contractors Association, the New York Building Congress, the Mason Tenders Union, the Association of Wall, Ceiling and Carpentry Industries of New York, Shea Stadium, Citi Field, Rockefeller Center, Grand Central Terminal, the Port Authority of New York, the MTA, Cadillacs, the Balkans. ← Who Is the Man With the Gun?